Win a signed copy of Jamie Zeppa’s “Beyond the Sky and the Earth: a Journey into Bhutan“! 1. Subscribing to BCF’s email newsletter. Come back and let us know you’ve subscribed in an additional comment below. 2. Becoming a fan of The Bhutan Canada Foundation on Facebook. Come back and let us know you became a fan in an additional comment below. 3. Following us on Twitter. Come back and let us know you’ve followed in an additional comment below. 4. Tweeting about the giveaway. Come back and let us know you’ve Tweeted in an additional comment below. The contest is open to residents of Canada and the United States only. The contest will run Thursday, March 1 2012 at 12:00 EST to Thursday, March 8 2012 at 11:59 EST. The winner will be chosen at random using Random.org and will be announced on the blog on Friday, March 9, 2012 at 12:00 EST. The winner will be asked to email BCF to claim their prize. If the winner does not respond within a 24-hour period, another random draw will take place. BCF will cover any shipping costs required to get the prize to the winner. Terms and conditions:NO PURCHASE NECESSARY. The Bhutan Canada Foundation’s contest begins Thursday, March 1, 2012 at 12:00 EST and ends Thursday, March 8, 2012 at 11:59 p.m EST. To enter, entrant must post at least (1) comment on the CONTEST BLOG POST on https://bhutancanada.org/category/blog/ (“Contest Site”) and provide their first name and last name for Contest winner contact purposes only. Minimum (1) entry per person with a maximum of (4) additional entries. 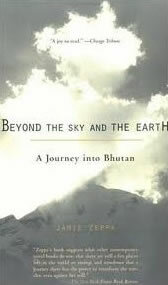 The prize consists of one signed copy of Beyond the Sky and the Earth: A Journey into Bhutan by Jamie Zeppa. Odds of winning vary depending on number of contest entrants. Draw will take place the morning of Friday, March 9, 2012 at 12:00 EST. All contest winners must answer a skill-testing question. If Sponsors are unable to access the potential winner within a 24 hour period, another random draw will take place. Email kristen@bhutancanada.org with any questions or concerns. Brought to you by The Bhutan Canada Foundation (the “sponsor”). Last April I traveled across Bhutan to visit teachers placed in Bhutan through the Teach in Bhutan program. For several weeks I drove across the country by auto, teetering on the edge of sheer drops and climbing some of Bhutan’s highest mountain passes. I saw schools in some of the country’s most remote communities and met students from all over Bhutan, some of whom have left the family home in pursuit of education. In one community, I met a young boy named Pema who walks seven kilometers to school each way, up and down a steep mountain path. His dedication amazed me, but his story is not unique. Pema is just one of thousands of young Bhutanese children eager to receive an education. I’ve included a photo from this trip, as well as a picture of the BCF teacher class of 2011, seen here with Honourable Minister Lynpo Thakur S. Powdyel, Minister of Education. Since 2010, The Bhutan Canada Foundation (BCF) has worked in partnership with the Ministry of Education and the Royal University of Bhutan to improve educational opportunities for students of all ages. Next year promises to be a tremendous year for The Bhutan Canada Foundation. I am writing to ask for your financial support of our work in Bhutan. 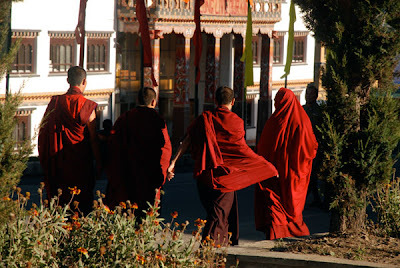 In January 2011, BCF sent nineteen teachers and university lecturers to Bhutan, where they joined five returning teachers already in the field. This group of adventurous teachers brought enthusiasm, experience, and excellence to their respective schools, often going above and beyond the call of duty to lead club activities, hold after-school tutoring sessions, and champion new school initiatives. In the classroom, BCF teachers were part of an effort of reduce average class sizes to more effective levels, model innovative teaching and learning techniques, and encourage the development of spoken and written English skills. Education remains vital to Bhutan’s continued development as a nation, as it does to the country’s ability to reduce nationwide poverty. According to a 2004 Poverty Analysis Report, attaining a mid-secondary level of education is enough to raise a person out of poverty. In 2012 we will continue to support Bhutan’s development, growing our program to reach new communities across Bhutan and increasing the number of BCF teachers in the field. We need your help to continue this important work. Over 81% of funds raised go directly to programming, which means each dollar you donate has an immediate impact. As a friend of Bhutan, I would like to ask you to support The Bhutan Canada Foundation by making a gift online at https://bhutancanada.merchantsecure.com/donatenow/ or by following the instructions below. The Bhutan Canada Foundation is committed to improving education in Bhutan. Just like Pema, we may encounter mountains along the way, but with dedication and support from donors like you, we will achieve educational excellence in Bhutan. On behalf of the BCF staff in Thimphu and Toronto I wish to thank you and your family for your support of The Bhutan Canada Foundation. We wish you all the best in the year ahead. P.S – This year every dollar you donate will be matched up to $25,000. Double your gift when you donate today! * Please make cheques payable to The Bhutan Canada Foundation. Support School Communities in Bhutan! Our teachers make a difference. You can too. BCF teachers make a difference in the classroom everyday. Outside the classroom they work just as hard by championing school development projects, which support the unique needs of their school community. Our teachers lead projects that engage students and focus of developing new skills and building community. You can help support these projects by making a donation to The Bhutan Canada Foundation today! Make a donation over the phone by calling (416) 572-3767. Check out BCF in You Tube’s "Good Work" competition! You Tube has partnered with the 58th Cannes International Film Festival on an interesting new program called Good Work, which gives creative professionals the opportunity to use their skills to make a difference and gain recognition for their work. Non profits all over the world often lack the resources and time to create truly spectacular promotional videos for their cause. These non profits submit a brief to Good Works which can be displayed on the brief gallery. Professionals can then pick the brief that appeals to them and create a video ad for that organization. The top 5 submissions will have the chance to show their work at the 58th International Cannes Film Festival! The deadline to submit your entry is May 9th so head over to You Tube to check out The Bhutan Canada Foundation brief! The Bhutan Canada Foundation is now offering the limited edition signed Robert Bateman print “Cranes of Bhutan” for sale on Ebay. This beautiful print is one in a set of illustrations from the book, “Birds of Heaven”, and has never before been offered for sale. The cranes pictured are held sacred in Bhutan, where they are often seen as harbingers of heaven and omens of longevity and good fortune. All prints are signed by Robert Bateman. Prints are 10.5″ by 15.75″ with borders of 2″ top/sides and 2.5″ bottom. All prints are unframed. 100% of funds raised through the sale of the print will go to support The Bhutan Canada Foundation programming in 2011. Prints are $195 + shipping and handling. Purchase your print today. Click HERE.